How I spent this CNY break? Reading. 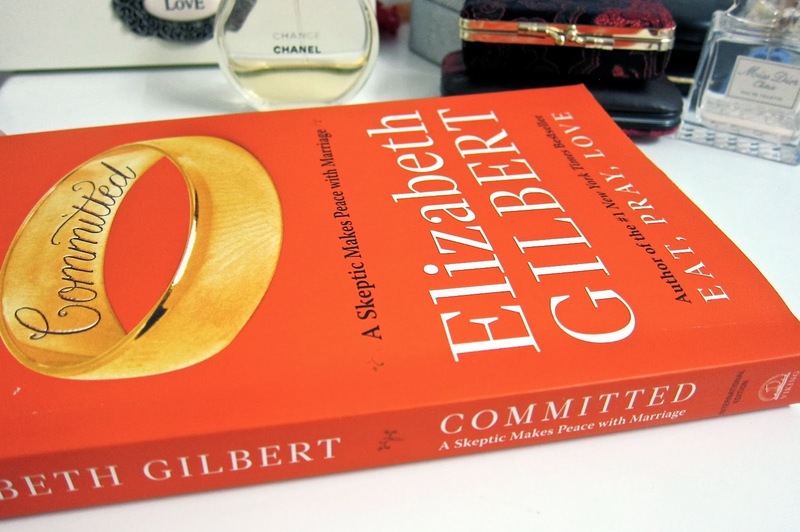 Bought this Committed by Elizabeth Gilbert book recently at Book Xcess, Amcorp Mall while waiting for him to finish work (I've yet to blog about this place, yes I know I said that a hundred times already it's almost obsolete) so I was determined to finish it by this weekend. Truth be told, I've never read Eat, Pray, Love - ever. Even the movie version. Even when the book first came out and everyone went crazy over it - they took pictures of their coffee mugs on a vintage table with the book by the side, which to serve its caption "to complete my soul-searching through this book"; even then, I wasn't fascinated. One thing about me is, I tend to dislike things that are widely accepted by people. Simply put, things are too "mainstream" (a phrase people used nowadays, oh the irony) - even for my bags, I won't buy those you've seen one too many times on the arms of supermodels or fashion bloggers and everyone would go out of their minds to get. So when Eat, Pray, Love came out, I didn't have any intention to read it. But when I saw this second book by Elizabeth Gilbert on the shelf, I was curious as to why I haven't heard of it anywhere when it's supposed to be the sequel to the first famous book, so that leads to me buying the book, just to answer that curiosity. And also, because of the title of the book. The verdict : I like Elizabeth Gilbert. I like how she thinks being labeled as a chick-lit writer is not a compliment. I resisted reading the reviews before reading this book because I'm easily influenced by reviews, so if you need reviews, it doesn't have positive ones as much as Eat, Pray, Love, because people are expecting this second one as a sequel therefore they feel like their expectations are not met. Which is true, because to me it's not a sequel - you can see it even from the title! It's about a person studying about marriage because she needs to get married not by her own choice, and in her principle, she doesn't believe in marriage. So she needs to convince herself and coming to terms with marriage before embarking into it. If you like reading about history, then this is somewhat good for you because she tells a lot about the history of how two people is bind through a civilized procedure dating back a few centuries involving religions and cultures and even authorities. But if you're looking for a lovey dovey couple and their romantic happily ever after story, then skip this book. If you're looking for the same soul-searching changing life book, skip this one. If you don't like reading hundreds of pages about history of marriage, you won't like it. Though it did make me evaluate my own take on marriage on some parts, so I think the book serves its purpose. Am still getting married, don't worry. Hehe.